The US Mint produced the Delaware Tercentenary Half Dollar Classic Commemorative Coin with a 1936 coinage date to recognize and celebrate the 300th anniversary of the Swedes landing in Delaware in the year 1638. The coin also includes the anniversary year of 1938. 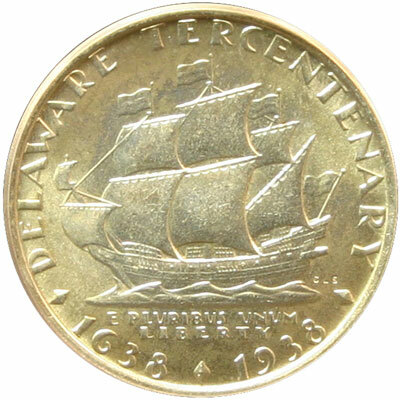 On May 15, 1936, the second session of the 74th Congress approved an act which became Public Resolution 74-91 that authorized "the coinage of 50-cent pieces in commemoration of the three-hundredth anniversary of the landing of the Swedes in Delaware." The law began, "That in commemoration of the three-hundredth anniversary of the landing of the Swedes in Delaware there shall be coined at a mint of the United States to be designated by the Director of the Mint not less than twenty-five thousand silver 50-cent pieces of standard size, weight, and composition and of a special appropriate single design, containing some recognized emblem of the State of Delaware, to be fixed by the Director of the Mint, with the approval of the Secretary of the Treasury, but the United States shall not be subject to the expense of making the necessary dies and other preparations for this coinage. "SEC. 2. The coins herein authorized shall bear the date 1936, irrespective of the year in which they are minted or issued, shall be legal tender in any payment to the amount of their face value, and shall be issued only upon the request of the president of the Delaware Swedish Tercentenary Commission upon payment by him of the par value of such coins, but not less than twenty-five thousand such coins shall be issued to him at any one time and no such coins shall be issued after the expiration of one year after the date of enactment of this Act. Such coins may be disposed of at par or at a premium by such commission, and the net proceeds shall be used by it in defraying the expenses incidental and appropriate to the commemoration of such event." The coin's estimated value ranges from $190 (low grade - XF) to $400 (high grade - MS-66). Extraordinary characteristics on the Delaware Tercentenary Half Dollar can command a price outside the estimated value range. 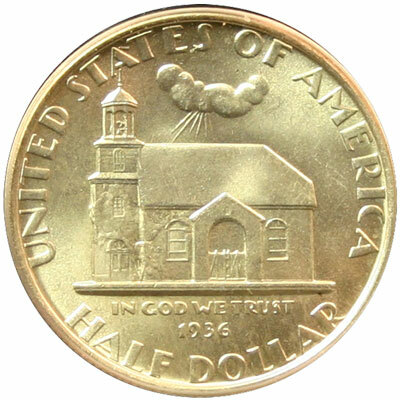 The obverse or front of the coin shows the Old Swedes Church in Wilmington, the oldest church still standing today. This coin was authorized in 1936 and struck by the United States Mint in 1937 with the anniversary year, 1938, also on the coin. The coinage inscriptions say, United States of America, Half Dollar, In God We Trust and 1936. The reverse or back of the coin features view of the ship, the Kalmar Nyckel, one of the Swedes' expedition ships. The coinage inscriptions read Delaware Tercentenary, E Pluribus Unum, Liberty and 1638-1938. The stated mintage was "not less than twenty-five thousand silver 50-cent pieces" and "coined at a mint." Records show the Philadelphia Mint produced 20,993 of the Delaware Tercentenary half dollar coins, which is less than the delivery number specified in SEC 2 of the law. With many commemorative coins in the mid-1930s, perhaps there was not enough interest in the coin. Any extra coins were returned and melted for recoinage. The Delaware Swedish Tercentenary Commission, created by Delaware's Senate and House, came into existence on March 20, 1935. The Commission's primary concern was to encourage permissive federal legislation for the minting of commemorative half dollars and to coordinate the designing of said coin. "...on account of the necessity of the congregations engaging the well learned and proper person Swen Colesberg, to serve as bell ringer, promising him for the year 2 shillings and 6 pence, and more as we are more able to pay, but as he was by no means able to support himself on that pay we took him especially for a schoolmaster, and agree to gather for him 18 or 20 children, and he is to keep school for a half year at Petter Mounson's..."
Converting to dollars using today's British Pound to Dollar ratio, 2 shillings and 6 pence equals $0.19. Taking into consideration CPI (Consumer Price Index, which is only readily available back to 1774) that would be an annual salary of less than $50 in today's buying power. That makes "...by no means able to support himself on that pay" an understatement. The first settlers, Dutch, arrived in Delaware in 1631. Their settlement was found burned and no one alive in 1632. In 1637, Christina, the Swedish child queen, granted a colonial charter. In November, two ships sailed for the New World, the Kalmar Nyckel and Vogel Grip. The Swedes landed in March 1638 and developed their first colony at "The Rocks" on the Christina River. They named their fort and village Christinaham after their queen. Today, the area is part of Wilmington. Visit our GACS Numismatic Shoppe Delaware Tercentenary for a variety of useful items decorated with images of the classic commemorative silver half dollar coin.